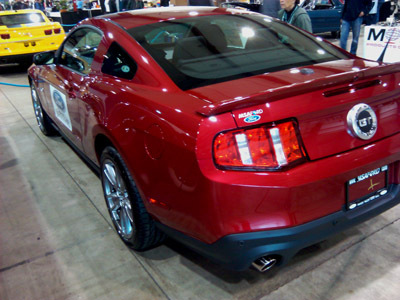 I Just checked out the 2012 Ford Mustang GT in it's newest color, Lava Red Metallic, and it looks great! Unlike the supposed pictures of the new Mustang GT, which are really 2011 cars, that you see on most sites, this 2012 Mustang is the real deal. Styling, remains virtually unchanged from the 2011 Mustang, which is fine, just the way it is, although, I'd still prefer the more traditional tail lights and bumper line, from the earlier versions. 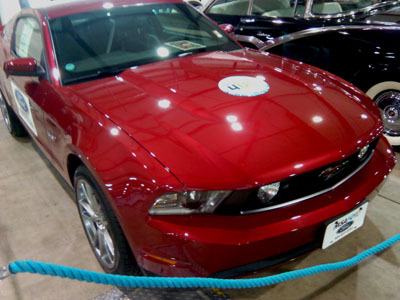 The 2012 Ford Mustang GT is easily identified by it's prominent chrome 5.0 logo placed just ahead of the doors. At the rear, you'll find a dark gray/black lower fascia, which curl around the dual chrome rolled exhaust tips. Check out this Blue 5.0 liter 2012 Mustang GT with these old skool retro Bullitt wheels! As noted in the 2012 Mustang section, there are more detail changes and improvements for the new model year, including some revised bright work and door panel design. The fit and finish continue to be high quality, compared to Mustang interiors only a few years ago. Like previous years, you can order either a standard interior or upscale GT premium edition, which, like the first days of the venerable pony car and it's pony interior, provides a number of tasty additions to the already good looking interior cabin. 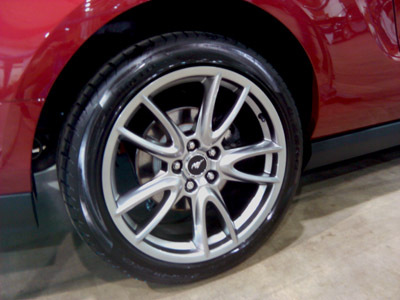 The 2012 Mustang GT retains the incredible 412 horsepower 5.0 liter Coyote V8 engine. Dyno tests of the 2011 models, have shown that this is a very conservative horsepower figure. And it seems more likely that actual horsepower is closer to 450 horsepower. Now that's a pony car! And of course, if that's not enough for you, there's always the 2012 Shelby Mustang GT500, with it's supercharged powerplant.